Donald Trump, the contents of a barbershop’s dust pan held together with the fat of Avian flu-infected chickens, has betrayed his campaign promise to drain the swamp, inviting Goldman Sachs after Goldman Sachs crony to join his polluted herd. On Friday, he announced his intention of making it far easier for bankers to con the American public—just like he has. 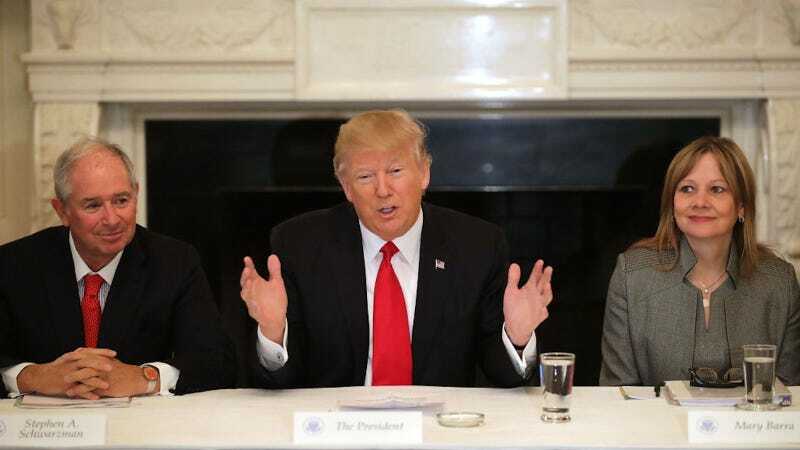 The New York Times reports that at a press conference following a White House meeting with business executives (seated next to Mary Barra, a heavy contributor to Lyft), the president signed a directive that will lead to an overhaul of the Dodd-Frank Act. The Act was crafted by President Obama in response to the 2008 economic crisis created by unregulated banks. Trump then signed a second directive to repeal a Labor Department rule that requires “brokers to act in a client’s best interest, rather than seek the highest profits for themselves, when providing retirement advice.” No more of that!